The rose is one of the most popular flowers in the world. It’s famous for its soft petals, beautiful appearance, and sweet scent. But, it also produces a fruit that has been used for its healing properties for thousands of years. Known as rose hips, evidence exists of the use of this fruit by the ancient Romans and Egyptians for health and beauty. And it also has a history of use in traditional remedies prepared by the Native Americans and the Mayans. An oil can be extracted from the rosehips. And as interest in natural beauty has grown, recent times have seen rosehip oil gaining increasing attention. It’s been publicly endorsed by celebrities such as Miranda Kerr, and is a well-known part of the skin care routine of Kate Middleton and Gwyneth Paltrow. The oil is packed full of essential fatty acids, antioxidants, and vitamins that are known to help the skin. And being a light oil, it makes a good alternative to popular oils like coconut oil that can cause problems for some people. 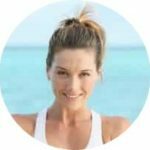 In this article, I’ll cut through the hype and the misinformation that surrounds this fabulous natural skin care ingredient. And show you the uses and benefits of rosehip oil for skin. And then we’ll take a look at how you can get started with making it a part of your regular routine. 1 What Is Rosehip Oil? 1.2 Is Rosehip Oil Good For Skin? Rosehip seed oil is extracted from the seeds contained within the small, bright red fruits that are produced after pollination by wild rose bushes. Most rosehip oil comes from the Rosa moschata or Rosa rubiginosa species and is produced in the Andes region of Chile. The oil can also be obtained from Rosa canina which is found in numerous parts of the world including Europe and South Africa. Rosehip oil is what’s known as a fixed oil or carrier oil, and is different from rose essential oil which many people confuse it with. Rose essential oil has a different composition and is obtained from rose petals, often by steam distillation. The best quality rosehip oil is extracted using a cold pressing technique that produces an oil that’s high in beneficial nutrients and free of the solvents that are used during the less desirable chemical extraction process. The oil extracted by cold pressing has been shown to have a trans retinoic acid content approximately 700% greater than that obtained through organic solvent extraction. This is important for the oil’s use in skin care because the trans retinoic acid is one of the main bioactive ingredients that give it it’s powerful skin regenerative properties. The oil produced ranges in color depending on how it has been processed. Rosehip oil that is unrefined usually has a red-orange color. Whereas oil that is refined and deodorized is often paler in color with a yellow hue that looks similar to oils like olive oil or argan oil. The oil doesn’t smell as you might expect. It has an earthy aroma that doesn’t capture the fragrance of the roses that produced it. The more refined the oil has been the less of a smell it will have. For use in skin care it is desirable to use rosehip oil that’s unrefined. Refined oil contains less of the beneficial phytonutrients that are good for your skin. Rosehip oil contains high levels of the polyunsaturated essential fatty acids linolenic acid and linoleic acid. It also contains smaller quantities of oleic acid, stearic acid, and palmitic acid. In addition to the fatty acids that make up the bulk of its composition it also contains tocopherols (vitamin E) carotenoids, flavonoids, and tannins (1). It’s sometimes wrongly said to contain high levels of vitamin C and retinol (vitamin A). While rose hips are known to contain vitamin C, the oil itself contains very little as it’s a water-soluble vitamin. It also doesn’t contain retinol, instead containing all-trans-retinoic acid. This is an acid of vitamin A that retinol has to be converted into in the body before it’s biologically active. Is Rosehip Oil Good For Skin? Rosehip oil is a highly regarded oil that’s commonly used on the skin for its anti-aging and skin nourishing properties. The omega 3, and 6 essential fatty acids it contains cannot be made by the body and are important for healthy skin. They help to moisturize and soothe inflammation, while the trans retinoic acid it contains aids skin regeneration. 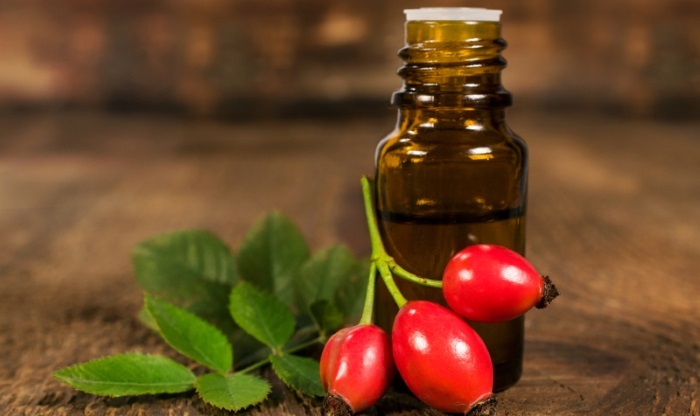 In recent times rosehip oil has seen increasing use in commercially available cosmetic products such as lotions, moisturizers, and shampoos due to the visible results it produces and its popularity with consumers who appreciate natural skin care ingredients. 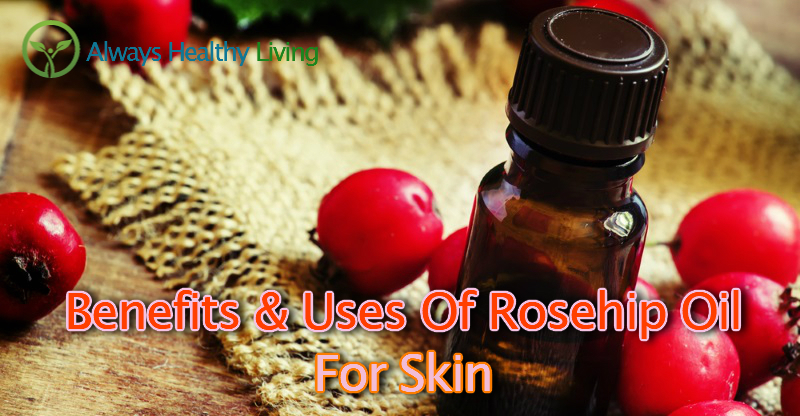 And many skin care enthusiasts choose to use rosehip oil as a carrier oil for their homemade topical preparations. Let’s look at the benefits and uses that rosehip oil has when applied to the skin in a bit more detail. Rosehip oil is rightly praised for its ability to moisturize the skin. It’s a light oil that is very easily and quickly absorbed and contains a high level of essential fatty acids. This includes linoleic acid which plays an important role in skin barrier function helping to prevent the skin’s moisture from being lost. Topical application of the oil on a daily basis will help to keep your skin looking smooth, plump, and well-hydrated. One of the main reasons for rosehip oil becoming so popular in the natural skin care community is the anti-aging benefits that it has when applied topically. It provides these anti-aging benefits In two main ways. Firstly, rosehip oil is rich in antioxidants such as tocopherols, carotenoids, and phenolic compounds such as P. coumaric acid (2). When applied to the skin, these antioxidants are absorbed and help to protect it by neutralizing harmful free radicals. These are often created by exposure to the sun’s rays, and by toxins and pollutants in the surrounding environment. The damage that these free radicals cause to the structural proteins in your skin are largely responsible for the visible signs of aging that appear over time including lines, wrinkles, rough texture, and sagging. Daily application of rosehip oil offers protection to your skin from the aging process. Secondly, the trans retinoic acid that it contains stimulates cellular regeneration and collagen production within the skin. This counteracts photoaging by improving skin texture and reducing the appearance of lines and wrinkles (3). 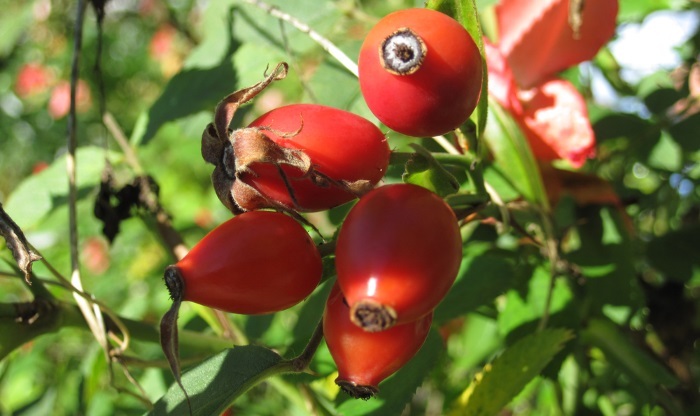 Rosehip oil has shown potential benefits for the prevention and treatment of scars. One study in Spain was carried out on 108 patients who were recovering from surgery on the skin. The regular application of rosehip oil was shown to reduce the appearance of surgery scars over a period of 12 weeks (4). There are also anecdotal reports of rosehip oil helping to improve the appearance of acne scars. However, no studies have been conducted to confirm these reports. But, rosehip oil does contain all-trans retinoic acid (tretinoin). Studies have demonstrated the ability of tretinoin to improve the appearance of acne scars, hypertrophic scars, and keloid scars (5). This provides a possible explanation for the results observed by people with acne scarring, but we await the studies that could confirm this. The moisturizing fatty acids that rosehip oil contains, along with its anti-inflammatory properties, could make it useful for relieving dry, itchy, and flaky skin, as seen in conditions like eczema and dermatitis. Rosehip oil is high in linoleic acid, and studies have indicated that supplementation with linoleic acid can improve atopic dermatitis (6). Scientific studies have shown that people who are suffering from acne usually have a low level of linoleic acid in the skin (7). Which suggests that the high level of linoleic acid that is present in rosehip oil could be of help with the condition. In addition, the trans retinoic acid that it contains has proved effective at treating acne in separate studies (8). And there’s further evidence that supports the specific use of rosehip oil itself. 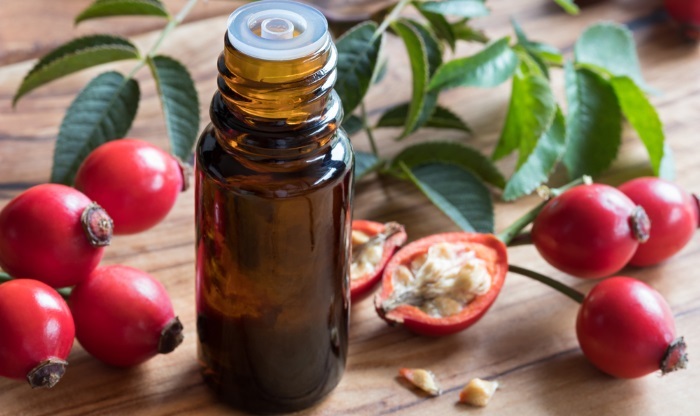 One study that looks at the effect of applying rosehip oil to the skin of patients with mild acne showed a significant reduction in the size of microcomedones found on the skin (9). And you don’t have to worry too much about it clogging your skin pores. Rosehip oil has a rating of 1 on the comedogenicity scale. Which means that while it’s not unheard of, the majority of people should be able to use it without the risk of making their acne worse. A number of scientific studies have indicated the ability of rosehip oil to help with healing small wounds and burns while also helping to keep the site well hydrated (10). In one study on 90 patients with burns, a 4 month course of treatment with topical rosehip oil resulted in a 97% improvement in comparison to their initial condition (11). In another small study, 10 patients suffering from leg ulcers were treated with a 26% rosehip oil solution with the results showing a significant improvement compared to the control group (12). There is some evidence that rosehip oil could help to prevent and improve the appearance of stretch marks. The trans retinoic acid it contains has been demonstrated in studies to reduce the appearance of stretch marks when applied daily for periods of 3 months or more (13). There are anecdotal reports of rosehip oil itself being of help, but no scientific studies that have examined it on its own. However, there is one study that looked at the effects of a stretch mark cream containing rosehip oil, vitamin E, Centella asiatica, and hydroxyprolisilane-C on the formation of striae during pregnancy. A significant difference was recorded between the group who used the cream and the control group showing the ability of the cream to prevent new marks (14). However, we will have to wait a bit longer for studies to be performed examining the effect of rosehip oil on its own. If your skin is red and sore from too much exposure to the sun, then rosehip oil can help to soothe and moisturize the affected area. The fatty acids it contains will keep it hydrated and prevent itch, while its vitamin E content works to minimize the further damage that occurs in the skin for many hours after you come out of the sun. Rosehip oil can also be used as a massage oil. Many people mix it with another carrier oil, such as coconut oil or the best almond oil, due to its cost. It can then be massaged into the body where its rejuvenating powers help to repair old and sun damaged skin. Rosehip oil is useful for getting rid of dandruff and other scalp problems. Rub the oil into your scalp 30 minutes before you shampoo your hair each day to see the benefits. If you are suffering from dry or cracked lips then rosehip oil is a highly effective treatment. It’s moisturizing properties prevent the excessive dryness and its regenerative properties help to repair the damaged skin. If you experience, dry, itchy, or sore skin after shaving then consider adding it to your shaving routine. Applying it to your skin after shaving can help to soothe inflammation, reduce dryness, and prevent razor burn. Many people find that it’s great at evening out skin tone and fading red blotches. Again, this is thought to be due to the trans retinoic acid content. It can be applied to the skin on its own or you can combine it with an essential oil of your choice and use it as a carrier oil. It’s best to use rosehip oil in the evening as the main anti-aging ingredient it contains, all-trans-retinoic acid, is degraded by UV light from the sun (15). But, you can also use it in the day if this is not so important to you, or if you will mainly be indoors. This also means that you should be careful to store your rosehip oil out of the sunlight. Preferably in a fridge to extend its life, as it can also go rancid. As always, use a sunscreen when going out in the sun. Retinoids can make the skin more sensitive to sunlight as they encourage exfoliation. It’s not clear to what extent this applies to rosehip oil with the amount of trans-retinoic acid that’s found in it, but you should be wearing sunscreen anyway, and if possible wearing a sunhat. 1. Get a bottle of pure, organic rosehip oil. 2. Put a couple of drops onto your fingers. 3. Massage the oil into the skin on your face after cleansing. 4. Use a cotton ball or tissue to soak up any excess oil on the skin. Lavender oil is a very popular essential oil that not only smells nice but also has anti-aging and acne fighting properties. 1. 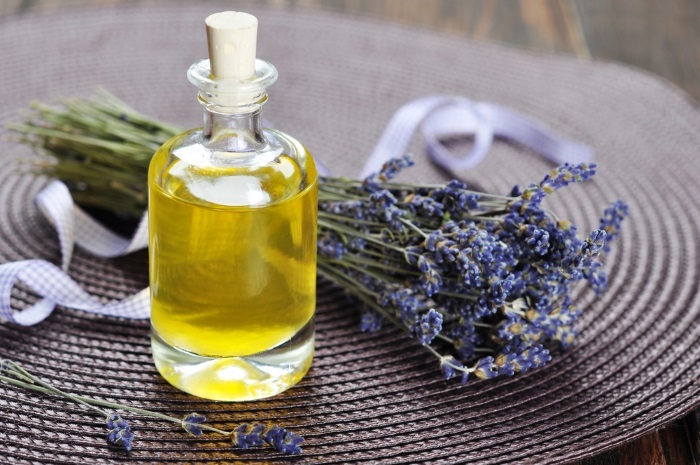 Get a bottle of the best organic lavender oil and a bottle of organic rosehip oil. 2. Put 1 tablespoon of the rosehip oil in a small bottle or container with a lid. 3. Add 6 drops of lavender oil. 6. Use your fingertips to massage a couple of drops of the oil directly into your skin. 7. Soak up the excess from the skin using a paper tissue or cotton ball. 8. Keep the same proportions if you want to make a larger amount. 9. Store the oil mixture in the sealed bottle in the fridge for further use. Before using rosehip oil for the first time, it’s best to check how your skin responds to it in case you have an allergy. Rub a small amount of the oil into the skin on the back of your wrist and leave it for about 20 minutes before applying it to your face. Some people with sensitive skin have reported a negative reaction, with it causing irritation or making their skin dry. Pregnant or breastfeeding women should consult a doctor before using rosehip oil. Is rosehip oil a carrier oil? Yes, it can be used as a carrier oil and combines well with essential oils in homemade skin care preparations. It has a 1 out of 5 rating on the comedogenicity scale, which means there’s only a small chance of it clogging pores. However, the comedogenicity ratings should only be considered as providing a guideline, as different people can respond differently. Is rosehip oil good for oily skin? Rosehip oil is known as a ‘dry’ oil because its quickly and easily absorbed by the skin. It hydrates the skin without feeling thick or heavy, and as mentioned above, is unlikely to clog skin pores. This makes it generally good for use on oily and combination skin, but individual responses can vary. Is rosehip oil the same as rose oil? No, rosehip oil is not the same as rose oil. Rosehip oil is a fixed oil taken from the rose hips of the wild rose bush. Rose essential oil is produced by steam distillation or solvent extraction from the petals of Rosa damascena. 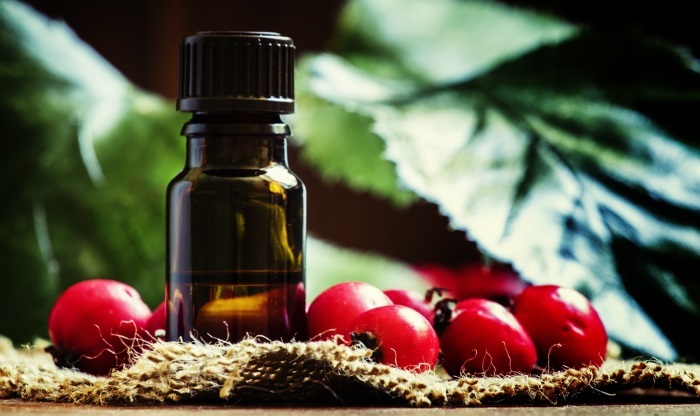 Can rosehip oil be used around the eyes? Yes, it can be used around the eyes and can help to reduce fine lines and wrinkles in this delicate area. Can rosehip oil deal with dark circles under eyes? There are anecdotal reports that it sometimes helps. Dark circles under the eyes can be caused by a number of different things including fatigue, puffy eyelids, and hollows that form under eyes as a normal product of aging. If it’s caused by excessive pigmentation then it’s possible that it could help as it contains all-trans-retinoic acid which can have a skin lightening effect and can also partially reduce areas of hyperpigmentation and dark spots, such as age spots and melasma (16). It also contains vitamin E which is known to lighten skin. But this use of rosehip oil has not been confirmed by any scientific studies. Does rosehip oil help rosacea? There are anecdotal reports of rosehip oil helping with facial rosacea, but there aren’t any scientific studies to measure its effectiveness.